It’s funny the foods that you crave. I keep surprising myself with what my tastebuds hanker after. My latest three cravings are mature cheddar cheese and milk chocolate digestives. Those two cravings kicked in a year after I moved and as I didn’t buy or eat a lot of cheese in the UK, can you see why I surprised myself?! My friend Hannah came to spend Christmas in Cambodia this year. I asked whether she’d like to bring out a selection of cheeses out with her so that we could have a cheese and wine evening. And she did! 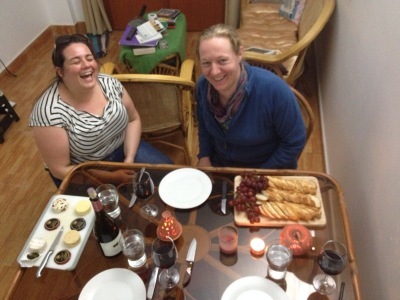 She had an unexpected 24 hour delay in Doha, and amazingly the cheese survived! 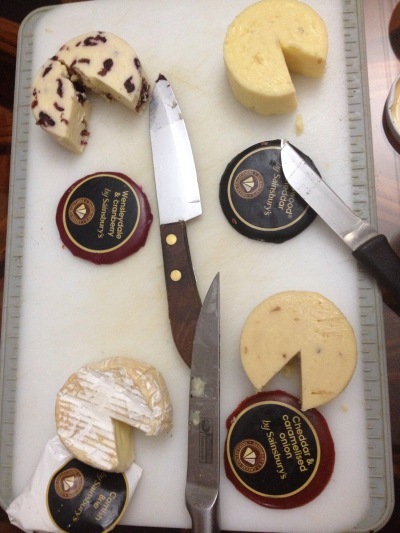 I don’t think that I’ve ever relished the flavours of each of those cheeses, as much as I did that evening! Thank you, Hannah. A selection of beautiful english cheeses, trying to disguise themselves as pac men. The camembert is baking in the oven. Thank you Hannah! Hannah and Esther waiting patiently for me to take this photo and finding it very funny! I’m pretty sure that Sainsburys does an AMAZING chocolate, cranberry and orange bread at Christmas time. I’ve eaten it pretty much every year since discovering it. Except last year. Last year, was my first Christmas in Cambodia and I couldn’t find any cranberries, frozen, fresh or dried in the whole of Phnom Penh. Not that I could search very far and wide because of my poorly left knee. I’ve been thinking about this eating this bread for a couple of months now. 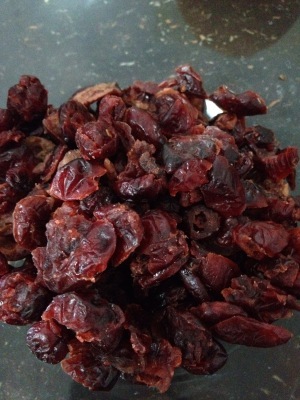 So in November, I bought a bag of dried cranberries whilst I was in Australia to bake it as my festive loaf. I couldn’t find a recipe for this bread online. 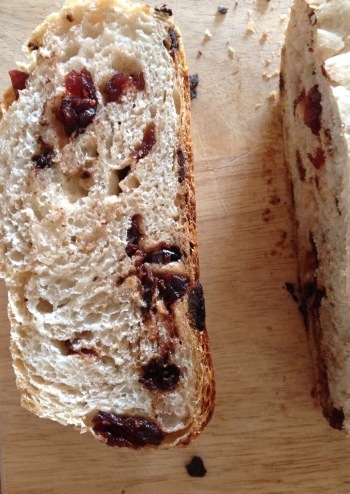 So, I modified Richard Bertinet’s cranberry and pecan bread recipe from Dough to recreate one of Sainsbury’s festive bread creations. I loved it. Hannah loved it. (She’d never heard of or eaten it before – WHAT?!?!? and she lives in the UK!) It smells intoxicating and the flavours balance and complement each other perfectly. We were happy to eat it, just as it was. No spread, it doesn’t need one. If you want to, you could try eating it with cheese, like we did. Surprisingly it works. Make sure that you use chocolate chunks and not chocolate chips. Chocolate chunks are bigger and taste more satisfying than chocolate chips. Make it a white loaf. It’s meant to be a festive treat. Don’t spoil it by adding more fiber to it. 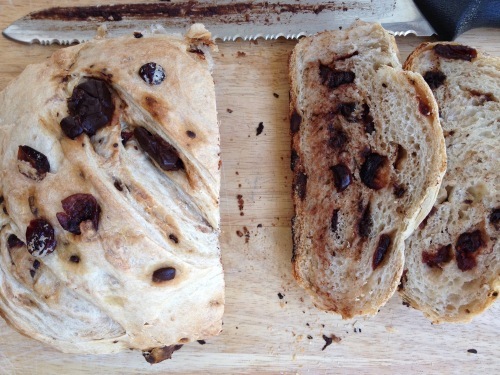 The chocolate makes it a messy bread to cut and eat. That could be because it’s just a wee bit warmer in Cambodia than the UK at this time of year… But I dare you to resist eating it when it’s fresh out of the oven! Finally, finally (and this isn’t late!). Hope that you have a wonderful New Year’s Day celebration and wishing you all the best for 2015. Ingredients for my oh so yummy, festive Orange, Cranberry and Chocolate Bread. 350g water – you can do 350ml but weighing it is always more accurate I think. 1. 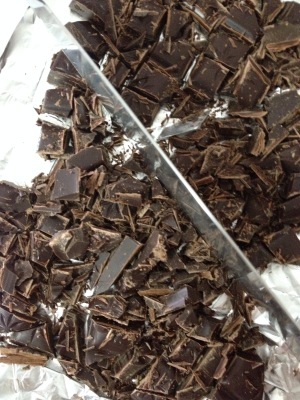 Put the dark chocolate, cranberries and orange zest in a small bowl and give it a good mix. 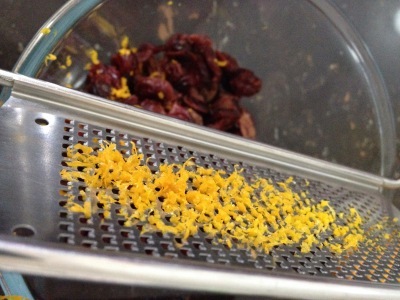 I discovered that the orange zest actually starts plumping up the cranberries while you’re making the dough – cool! 2. In another medium sized bowl, weigh out the flour, add in the yeast and give it a quick stir to mix it into the flour. By mixing the yeast with flour first, I don’t worry about the salt touching the yeast and thus deactivating the yeast. 3. Now add in the salt, give it a stir. Then add in the water. Use a dough scraper, or your hands to combine the water and flour together as much as possible before turning the mixture out onto your work surface. It is quite a wet dough to begin with, so don’t worry. 4. Knead until the dough is springy and smooth. This probably takes about 10 minutes but it depends on what method you use and how wet the dough was to begin with. I use Richard Bertinet’s slap and fold method. 5. Now transfer the orange zest, cranberries and chocolate into the medium sized bowl you used for the dough mixture. Then, lay the dough on top and spread it out so that it envelops the entire surface. What you’re going to attempt to do next is wrap the dough around the chocolate and the cranberries and mix it so that you can combine them with the dough. Doing it this way in the bowl makes it a much neater, efficient process, than if you were to do it on a work surface. 6. 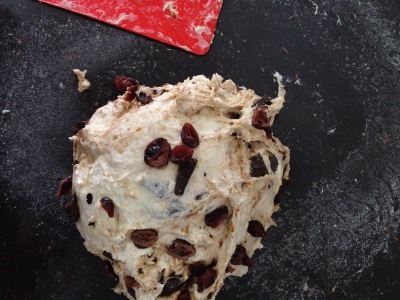 Once the chocolate and cranberries are combined with the dough, turn it out from the bowl briefly. Add a little bit (about a tablespoon) of vegetable oil to the bowl to prevent the dough from stick to it as the dough rises. 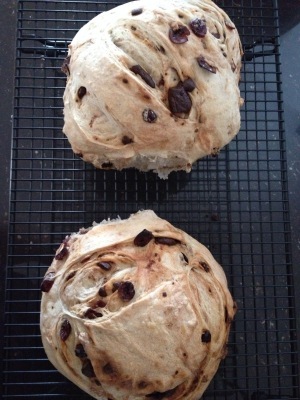 Cover with cling film or a wet tea towel and leave it rise. I leave mine to rise in the fridge for a couple of hours so that the flavours have longer to mature. You could leave it at this stage, in the fridge, for a couple of hours to 2 days. 7. Prepare a baking tray by lining it with baking paper, or covering it with a layer of semolina so that it doesn’t stick to the tray. Once the dough has doubled in size, turn it out onto your work surface. Push your fingers firmly into the dough to leave dents. This is a much gentler way of knocking the air out. While you’re doing that try to shape it roughly into a rectangle. 8. Next, strengthen the dough. Mentally divide the dough into three sections. Take a third of the dough to the centre and push it down firmly in the middle with the heel of your hand. Then take the other third of the dough to the centre and push it down firmly with the heel of your hand. Finally fold the mixture in half and again push it down firmly with the heel of your hand. 9. This next bit is up to you. I cut my dough into two halves and shaped one into a circle and the other into a square-ish loaf. You can shape it into one or as many loaves as you wish. Cover with damp tea towel or oiled cling film. Let them rest until they have doubled in size again. In the meantime, preheat the oven to 250°C/480°F/Gas Mark 9. 11. Whack them in the oven. After 10 minutes turn the oven down to 220°C/425°F/Gas Mark 7 and bake for 40-50 minutes. Check that the bread is ready – it should sound hollow when you tap it’s bottom. If not, set the timer for another 5 minutes and check again. Let them rest for at least 5 minutes before you enjoy and devour it.